Rectangular surface (23.77 m x 8.23 m for singles, 23.77 m x 10.97 m for doubles) designed for playing tennis; it is divided in half by a net. Official who signals center line service faults and informs the umpire when the server commits a fault. Vertical pole that stretches the net by means of a net band, keeping it 1.07 m above the court. Line that marks the sides of the playing area for doubles matches (two teams of two players). Official who signals service line faults and informs the umpire when the server commits a fault. Broken line marking the middle of the baseline; players use the center mark to take position for serving or receiving. Person who retrieves balls from the court after each rally in a tournament. Band that is 1.37 m wide on the sides of the court; the alley is used only for doubles matches. Official responsible for applying the rules; the umpire ensures that the match runs smoothly and rules on contentious points. Player who returns the ball put into play by the server. One of the officials who ensure that the ball remains inside the lines of play and inform the umpire when a player commits a fault. Official responsible for calling net serves; the net judge also regulates net height before and during a match. Strip of fabric connected to the ground in the center of the net; it keeps the net at regulation height (0.914 m). Strip of fabric with a cable passing through it; it is attached to poles to suspend the net. Official responsible for signaling foot faults, which occur when the server steps on the baseline. 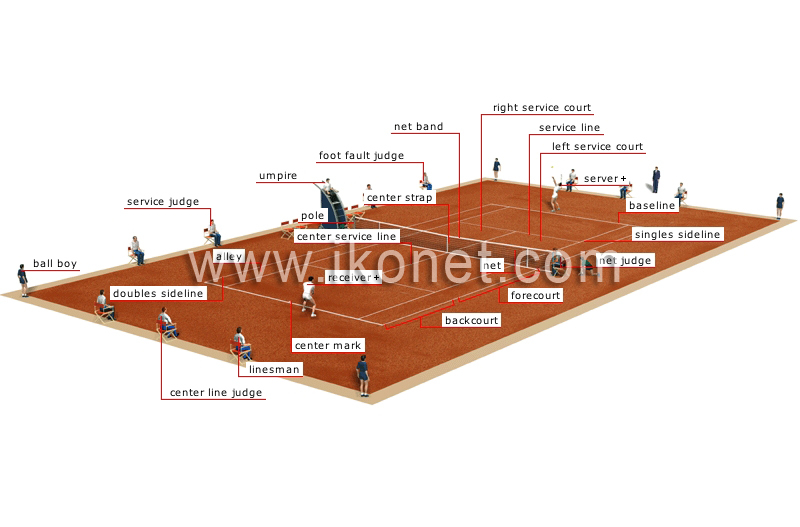 Zone in which the serve must bounce; it is diagonally opposite the server. Loosely stitched divider stretched across the middle of the court; players must hit the ball over it. Line that marks the side of the playing area for singles matches (two players). Line on each side of the net and parallel to it at a distance of 6.4 m; it marks the back boundary of the service courts. Line marking the end of the court; the server stands behind the baseline. Player who puts the ball into play; the server and receiver must stand in diagonally opposite zones. Zone between the service line and the baseline. Zone between the net and the service line. Line dividing each forecourt in half.